As soon as I saw this plant in the catalogue I fell in love with it. Busy Lizzie ‘Wild Romance’ is in my opinion the best double flowered Busy Lizzie on the market. But what is different about it? We have had double flowered Busy Lizzies available for many years. Well this one is one of the New Guinea Busy Lizzies. This makes it far more disease resistant than our traditional bedding Busy Lizzies. The smaller, weaker Busy Lizzies that we used to grow so easily sadly were all but lost to the fungal disease downy mildew, and therefore many growers ceased to grow them. The New Guinea types are able to resist this devastating disease far better. Therefore for years we have been favouring these stronger, larger growing hybrids. We have probably all grown the single flowered varieties, but now we are lucky enough to be able to grace our gardens with this delightful double flowered variety with miniature rose style blooms! The flowers are long lasting and will freely flower from May to October in sun, or the plant will be equally at home in a semi-shaded spot. Deadheading the plant is unnecessary as it is self cleaning. This means the flowers will drop to the ground of their own accord when each bloom has faded, making way for many more to come. The exquisite, pale pink rosebud blooms contrast beautifully with the dark green leaves, setting them off to perfection. Each plant reaches proportions of a height and spread of around 30cm (12in). This is considerably larger than the Busy Lizzies we once grew, and so less plants are required to fill our containers and borders. This stunning plant is easy to grow, even for the beginner. 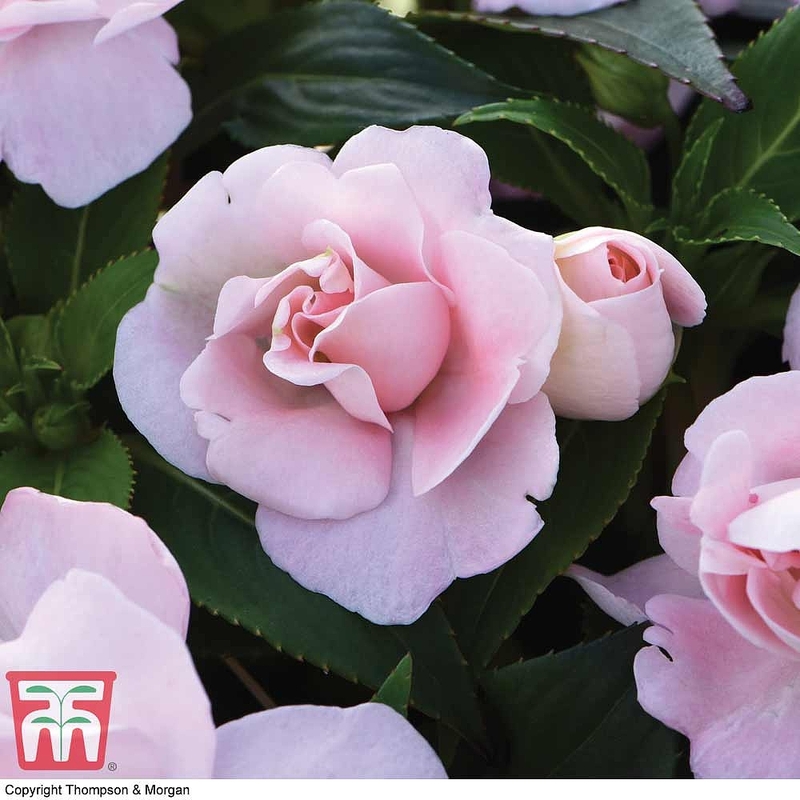 Busy Lizzie ‘Wild Romance’ is currently exclusive to the world renowned supplier Thompson and Morgan who introduce so many of the best new varieties for us to grow in our gardens. 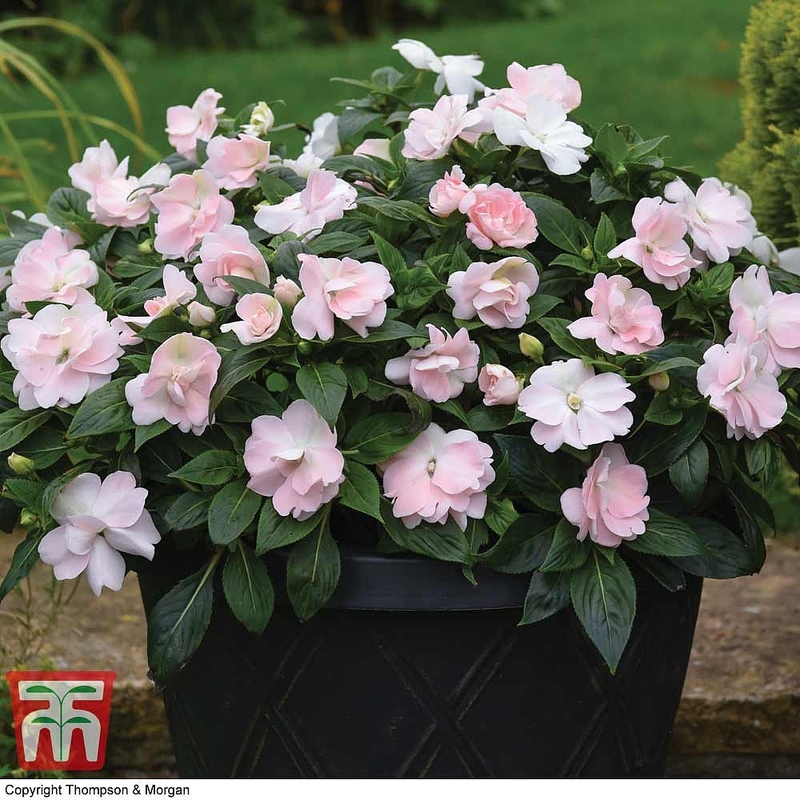 To view this plant on Thompson and Morgan’s website and for buying options please click here. As with all Busy Lizzies, these plants are only half hardy and so will need to be kept on a windowsill or in a greenhouse until frosts are over. This will usually be in mid to late May in Southern regions of the U.K, but may be considerably later further North. Thompson and Morgan will keep these plants on the nursery until nearer the time and despatch them to you fresh. It may seem early to be planning your summer floral displays, but ordering now ensures you will receive the best varieties before they sell out. It also means the plants can be grown for you specially and you will receive the pick of the crop. I hope you all get as much enjoyment from growing Busy Lizzie ‘Wild Romance’ this summer as I certainly will.